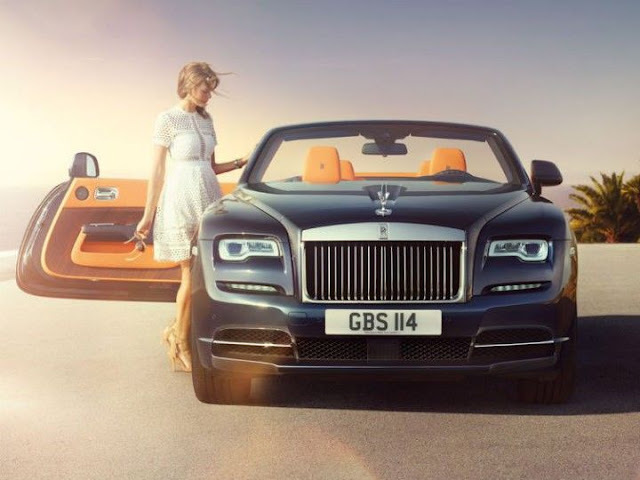 Rolls-Royce will be launching a two-door, four seater convertible- "The Dawn"
The Dawn was first showcased at the 2015 Frankfurt Motor Show. The company also claims that the Dawn has enough room for four adults to sit comfortably and the only parts that it shares with the Wraith are the doors and the grille comfortable according to surround. British carmaker 's RR The Dawn will be available with a massive 6.6-litre & twin-turbo V12 which gives a huge output power 570PS of maximum and with epic 780Nm of peak torque at wheels. The Dawn will be available with an 8-speed ZF gearbox. The Dawn is powered by the rear wheels drive. The Dawn is loaded with lots of new features. like with a Satellite Aided Transmission which uses GPS to predict the road ahead of the car and helps to adjusts the transmission accordingly to the position & traffic control systems Etc. It also available with The BMW's massive technology iDrive system with a 16 speaker best audio system. CBU(completely built-up unit) of Rolls-Royce's the Dawn will be launching in India on June 24 as per the official news.